Custom plastic molding manufacturing is a process of shaping liquid or any pliable material using a mold or matrix. During plastic molding, a powder or any liquid polymer such as polypropylene or polyethylene is put into a hollow mold enabling the polymer to takes its shape. Amount of heat and pressure used to make the end product varies depending on the type of molding process. The most popular plastic molding techniques are injection molding, compression molding, cast molding, thermoforming and extrusion molding. Creatingway share these details information to our customers. This process involves molding custom plastic parts through injecting plastic molten substance into a metal mold under high pressure. The mold is then cooled and opened revealing the finished product. This plastic manufacturing process is common when making large volumes of custom plastic parts. Car parts can also be molded using large injection molding machines. Plastic resins and other additives are used in this molding process to increase the flexibility of the product which is beneficial to engineers and designers. Molds made from aluminium and steel are expensive but the cost is economical if parts are needed in bulk. Like the name suggests, Compression molding is done by placing a heated plastic material into a heated mold. The material is then compressed into a desired shape producing sheets of plastic material. The heating process makes the plastic maintain maximum strength. After cooling and trimming the mold, the plastic material is then removed. Compression molding is commonly used in the replacement of metal parts with plastic ones. This method is also used in the manufacture of small plastic products in large volumes. Automotive industries heavily use this custom plastic molding manufacturing process because its end products are extremely strong and durable. The cost of a compression mold is quite substantial although it largely depends on a number of factors such as the surface finish, number of cavities, complexity of the work and the size of molded parts. In this plastic casting method, a synthetic resin normally in liquid form is filled inside a mold and allowed to harden. This molding technique is used in the production of industrial prototypes, jewelry, toys and models. The basic synthetic resin used in this process is a monomer which polymerizes forming a polymer that hardens after the setting process. Transparent casting resins can be used to make sculptures, models, jewelry and other small parts. Resins used in casting come in form of a hardener and a main plastic that are chemically combined to form a rigid and solid plastic through a process referred to as curing. In this process, a thermoplastic sheet is heated and is designed to a particular shape in a mold. Its then trimmed to create a final product. The thermoplastic is available in a wide range of materials, colors, thickness and finishes. Thermoforming is a low cost process since it uses relatively low pressure to manufacture products. Containers, disposal cups, lids, trays among other products used in retail industries are made from thin-gauge thermoforming. Products such as dash panels, vehicle doors, refrigerator liners among other products are made from thick-gauge thermoforming. This molding method is similar to the injection process only that a continuous and long shape is molded. Unlike the injection process where a mold is used, extrusion molding involves pressing raw and hot material through a die. The shape of the custom die determines the shape of the end product and not the mold. The simplicity of the custom die used makes this process economical. Molded plastic components can be assembled in a number of ways depending on the method of molding. One of the easiest ways to join plastic parts is through designing fasting elements such as latches or hinges into the plastic part. In order for joints to survive repeated use and the strain of the assembly process, strong plastics are used for this process. Mechanical fastening is also used to join molded components through the use of fasteners such as rivets, screws, nuts and pins. These mechanical fasteners are glued or molded in place. For parts that need to be serviced or replaced regularly, metal screws are used since they can withstand constant disassembling. Solvent bonding is also used to join thermoplastics where the plastic parts are softened with a solvent then clamped together. After the solvent evaporates, the parts bond together. 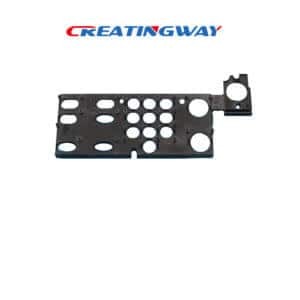 Creatingway offers custom plastic molding manufacturing and assembling services at relatively low costs to our global customers . We also do mold typing and mold designs at customer friendly prices.